We were very fortunate to have crisp, winter weather last Saturday for the Annual OCAD University Book Arts Fair. You must by now have heard of the annual fair, but for those who haven’t, it’s a fantastic show held at the end of the year that exhibits handmade books, paper, prints, zines, and small press publications. There were a variety of artists and artisans there this year, ranging from OCAD U printmaking students to established wood engravers. I was very happy to be thrown into it, and spent the day learning about printmaking and nearly getting myself sick with lead poisoning. Saturday morning saw me speed walking down Dundas, trying to get to OCAD U in time for my arranged meeting with Tim Inkster. An inexplicable stomach cramp had rendered me unable to consume my necessary cup of coffee before I left my house, so I had stopped at a Starbucks on the way to the fair. I arrived, not five minutes past 9am, with spilt coffee dripping down my mittens. Tim wasn’t present, but he had been and gone, claiming a table for us and returning to his car to get the books. The fair was being held in the Great Hall and several artisans were already there, setting up their tables, milling about, saying hello to old friends. When Tim returned we began putting out the books. He had brought several of George A. Walker’s, including Book of Hours, Alice’s Adventures in Wonderland, and Images from the Neocerebellum. He had also brought copies of George’s student’s work, Back + Forth, Wanderlust, and Let that Bad Air Out. But perhaps most exciting was P.K. Page’s Brazilian Journal, which was hot off the press in Erin. Not only is this book hot-off-the-press, it’s also just hot: fuchsia end papers, lavish illustrations, a ravishing full-colour centrefold. … It went in the front on the display, where everyone would be able to see it. Tim Inkster selling books at the Porcupine's Quill table. I didn’t know it at the time, but the day was going to be all about education. At the beginning of my internship here at the Quill I am ashamed to say I made quite a few blunders, calling ‘wood engraving’ ‘wood cutting’, or labelling an ‘engraving’ as an ‘etching’, or even mixing up different types of printmaking. But at OCAD U I had the opportunity to meet artists directly and speak with them about their work. I was even lucky enough to get a tour of OCAD U’s printmaking department by associate professor George A. Walker himself. When past-Porcupette Monique arrived, George whisked us off to the printmaking department. OCAD U’s printmaking department is quite extensive, covering the five main areas of printmaking: etching, lithography, relief, screen-printing, and papermaking. George swept us first into his studio where he teaches the art of letterpress. Letterpress is nineteenth-century printmaking technology. To make a print using letterpress, images are embossed onto a surface, inked, and then pressed into paper. The pressure is so intense that the process leaves a depression in the paper, which you can feel when you run your fingers across it. Art can be carved into a variety of materials, like rubber or wood and then pressed into the paper; however, text must be set with a fascinating device known as an Intertype or Linotype machine. 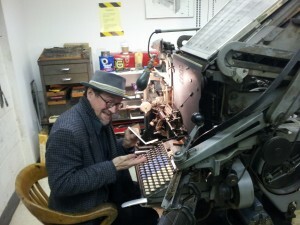 George demonstrates the use of the Intertype machine. The Intertype machine is fit with a keyboard, where you can compose lines of text. George sat himself at the machine and prodded at the keys as he spoke. As he wrote out a line, he showed us how moulds of the appropriate keys were selected and arranged in the machine. When he was finished, he explained how molten lead is then poured into the moulds. The lead hardens, producing a perfect line of text. The letter moulds are then separated, sorted, and returned to their spots while the line of lead is removed and ready for print. 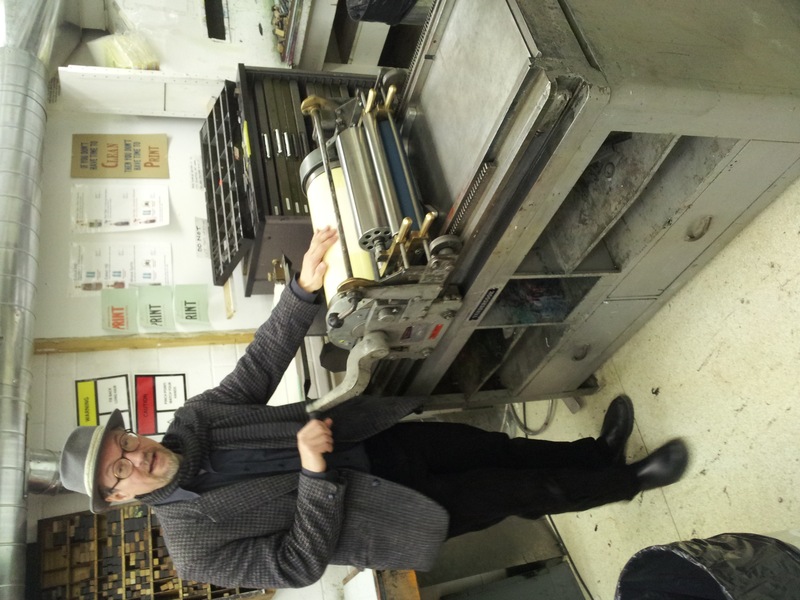 He then brought us over to the letterpress, where the lines are arranged into a paragraph of text. 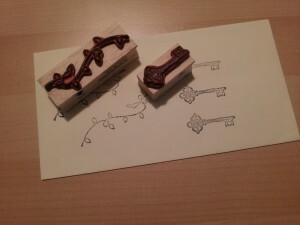 They are then inked and the paper is pressed tightly with a few quick turns of the letterpress handle. George smiled as he briskly rolled the paper over a small block of wood to demonstrate. George shows us how prints are made using letterpress. Needless to say, Monique and I were both fascinated by this process. George brought us over to a work table fitted with several drawers and began pulling out the crafted stamps his students use to make their images. I was drawn to several metal lines of text strewn on top of the table, which I suspected came from the intertype machine. Picking them up I read the backwards words raised in the hard lead. Monique did the same and George, laughing, said we could keep them. A perfect, metal line of text. But George also quickly cautioned that we should be sure to wash our hands before we ate, as ingestion of lead leads to lead poisoning. And then we were off, out the door, down the corridor, and into offset printing. I looked down at my fingers. Lead poising? Didn’t lead poisoning kill people? But there wasn’t time for that, George was already launching into a description of offset printing, which is printmaking using twentieth-century technology. Consequently, it also happens to be the technology the Porcupine’s Quill uses to make their books. 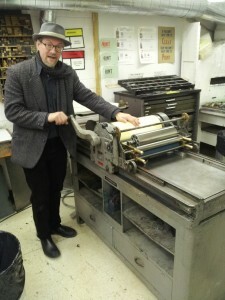 George explained that while letterpress is physical, offset is chemical. Offset printing works on the premise that oil and water do not mix. Images are put onto plates and then dampened, first by water and then by ink. Since the ink is oil based, the ink and water separate. The ink adheres to the image area and the water to the non-image area. The image is then transferred onto a rubber blanket and then onto the paper. That is why images printed using this method are not depressed in the paper the same way that letterpress images are. At OCAD U they use blocks of limestone instead of plates, and the room has several large, damp slabs of stone, wet with water and ink. 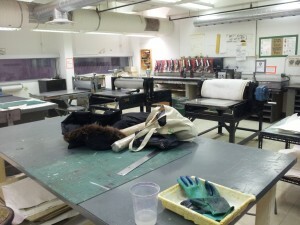 A printmaking classroom at OCAD University. After offset printing George lead us through a series of inner doors, back into the hallways and into another printing room where we found ink guns, a massive hot plate and a dark and dangerous-looking acid room. Though I’m still not quite sure what the acid room was used for, I was beginning to realize that printmaking is a pretty dangerous profession. Between the lead poisoning and heady acid fumes, I was quite relieved to get back to the Great Hall and the relative safety of the Porcupine’s Quill’s table. Monique and I carefully placed our lines of text into our bags and washed our hands thoroughly, and while I think I may have accidentally ingested some lead, I have yet to develop any symptoms. Things were busy at the PQL table, and when Monique went to visit with the Walkers and Tim left to have some Indian food, I was trusted to man the table myself. It wasn’t until later in the afternoon that I was able to do some more exploring. But explore I would when I learned that there was another intern at the fair that I might benefit from meeting. I had met Wesley Bates, wood engraver and illustrator of Kildare Dobb’s Casanova in Venice, earlier that morning when he came over to say hello to Tim. After he had left, Tim pulled out a copy of Casanova and flipped through its pages to show me Bates’ engravings. Bates’ images are crisp, with sharp lines and incredible detail. They are exquisite, and picturesque. But when you look more closely, there is also a playfulness present, an incongruous bluntness, which was so unexpected that it made me laugh. Just before the fair was beginning to close down, Tim pointed out a sprightly young woman at Bates’ table across the hall, saying she was Bates’ intern. Intrigued, I made my way over to say hello. Glynis, Bates’ apprentice, was even more slight up close, small boned, of short stature, with large eyes. As we spoke, I learned that our internships are completely opposite from each other. I live at home and do my work through email whereas Glynis has moved to Bates’ home in Clifford where she does her work in his studio. Tim would explain to me later that Erin—barely a city block long from what I understand—is a thriving metropolis compared to Clifford. But the location seems to suite Glynis well. She has apparently just bought a farm and seeks to find a balance of art and farm life in her future. She said that working with Bates, she is always trying to limit the layer between herself and her art. The more she is able to eliminate technology, the more she is able to do by hand, the better. 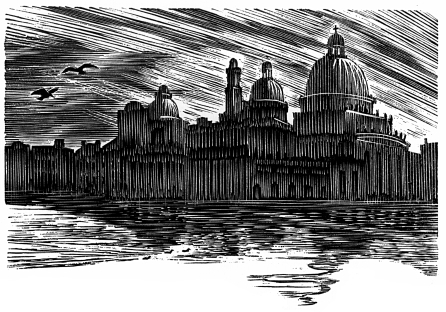 An engraving by Wesley Bates from Kildare Dobb's Casanova in Venice. I found Glynis extremely refreshing, and a delight to speak with. I think everyone can understand her desire to feel more connected to their work and, consequently, to their world. 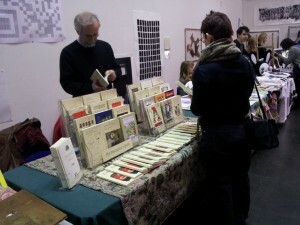 Surrounded by artists and artisans at the Book Arts Fair, it occurred to me that this was what the fair was about. It was a bringing together of like-minded individuals. It was a celebration of the craft, of the people who chose to live their lives with and through their hands. Much like the nineteenth-century printers before them, pioneers of the letterpress, whose fingernails were always caked in ink, hands always covered in poisonous lead. I for one found the fair inspiring. I have even been out and bought myself a poor man’s printing press: rubber stamps. Perhaps I will make my own Christmas cards this year! The beginning of my printmaking enterprise: rubber stamps.